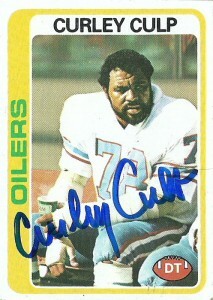 Curley Culp is another great example of a player that if they inducted a player at every position into the HoF, – Culp would be inducted at the inglorious, in the trenches position of nose tackle. When people talk about players who redefine a position, I think of Culp defining one all by himself. He not only was a member of the Kansas City Chiefs NFL Superbowl victory, he also reinvigorated a sad sack Houston franchise on defense by being the final cog in challenging the supremacy of the Pittsburgh Steelers during the 70s. After graduating from Arizona State in 1969, the Denver Broncos drafted Culp with their second round pick of the common NFL draft. Unable to make the squad, Culp was considered undersized and too slow to play linebacker or defensive end, but had some great advantages in his strength, quickness off the line, and technique. He was an enigma. Moving on to the Kansas City Chiefs, Curley played defensive tackle and was inserted into the lineup and played directly over the center, creating one on one situations, and opening up interior lanes for rushers. This heralded the birth of the 3-4 defense and the nose tackle position. 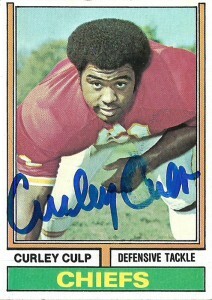 While with the Chiefs, Culp appeared in 82 contests, the 1969 All Star Game, the 1972 Pro Bowl, and was a key cog in Kansas City’s Super Bowl IV victory. In 1974, the NFL began to feel pressure from a new upstart league: The WFL. At the same time as Culp began to make rumblings about leaving for the other league to play for the California Sun, defensive coordinator Bum Phillips of the Houston Oilers, had convinced head coach Sid Gillman that the 3-4 could be run full time in the NFL. 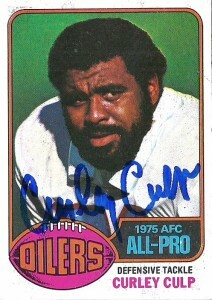 He insisted that the main piece that he needed to begin a defensive renaissance in Houston was Curley Culp. Pulling the trigger in exchange for John Matuszak, the Oilers struck gold and immediately saw dividends on their investment into Culp as in 1975, he was named AP defensive player of the year after recording 11.5 sacks for the Oilers. Culp would remain a stalwart member of the Houston defensive front, but as injuries mounted, he would be cut midway through the 1980 season, sign with the Lions and retire after the 1981 season. Culp somehow ended up down the street from me in the Austin suburb of Pflugerville. When I learned of this, I quickly shot him a letter and a few cards to sign. I love his Topps 1975 card. He looks like a hungry, angry hobo with that grizzly beard. A 5 time Pro Bowler, a member of the Kansas City Chiefs 35th anniversary team, the Chiefs All-Century team, the Oilers All-Century team and inducted into the Chiefs HoF, Culp certainly has the credentials, but lacks the glamour and tracked statistics to be in the HoF.